This week the challenge is Die Crazy! I went crazy with Simon Says Stamp Dies and here is my card for the challenge. I started with die cutting a white cardstock using the largest of the Simon Says Stamp Stitched Rectangle die. I then sponged Tumbled Glass, Salty Ocean and Mermaid Lagoon distress ink from the bottom of the panel to the top in an ombre leaving the top of the panel white. I then die cut Simon Says Stamp Snowflakes Border die in gold foil and silver glitter papers. Then I layered and glued them on the sponged area of the panel. For the focal point, I die cut Rylynn Snowflakes die in silver glitter paper. The sentiment is from Holiday Hellos stamp set stamped on Simon Says Stamp Tilted Banner die cut. Embellished with the gorgeous sequins from Simon Says Stamp December card kit. Your metallic snowflakes are GORGEOUS, Gayatri! Beautiful card! Your card is gorgeous, my favorite! A beautiful card Gayatri, a super gorgeous layer of the pretty snowflake border and the larger snowflake scattered with sequins!! Hi Gayatri, this has got to be the most spectacular card I have seen. 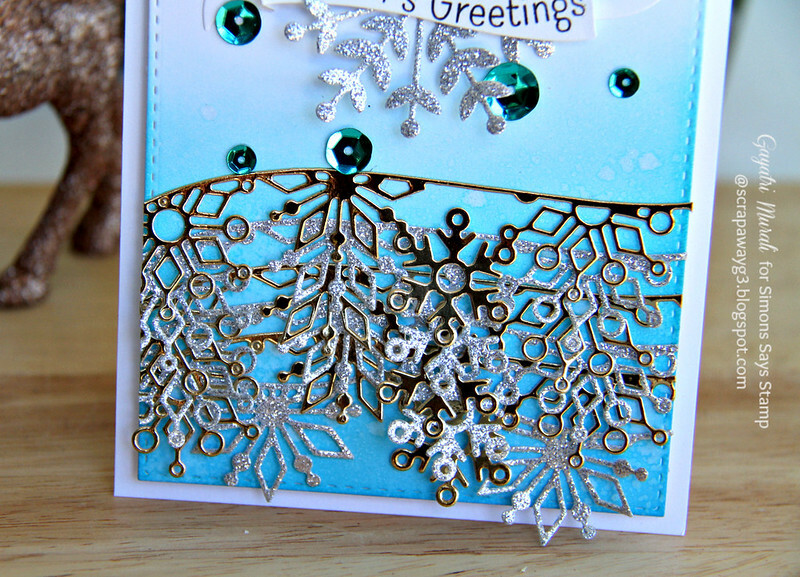 I love how you have used the snowflake line die, brilliant and the little bit of blending d the sequins all so so perfect. This card is just breathtaking….so so beautiful!!! WOW! Gorgeous, Gayatri! Stunning use of die border! Lots of sparkle and shine on this one! Love it!